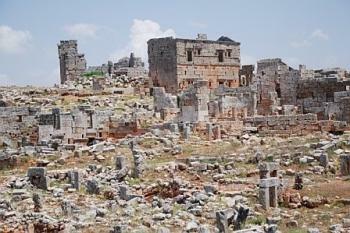 The Ancient villages of Northern Syria are the remains of rural societies from late Antiquity and early Christianity. Basilicas, pagan temples, bathouses, residential areas, pilgrims dwellings, inns, Roman tombs and temples are found among the ruins. The inhabitants gradually converted to Christianity. They were inspired by hermits such as Saint Simeon, who drew lots of pilgrims. Subsequently a powerful monastic movement developed in the region. After the mid-6th century, the area gradually fell into decline due to food shortages and epidemics. From the 10th century on it became totally deserted. As it has been abandoned for nearly one thousand years since its occupation in ancient times, it has been called the region of "dead cities". I visited Syria largely by public transportation in May 2009. After taking a bus from Palmyra to Aleppo, with a stop in Homs, I checked into the Baron Hotel, the oldest hotel in Syria, where I stayed in room 203, the same room where Agatha Christie wrote the first part of "Murder on the Orient Express." Mr. Walid, the Baron's renowned manager, organized a car and driver for a day trip to several nearby sites, including Serjilla and al-Bara (and its Tombeaux pyramidaux), two of the Ancient Villages of Northern Syria. During that same day trip, I visited Apamea to see its Great Colonnade, the main colonnaded avenue which runs for more than a mile and is among the longest and best preserved ancient Roman streets, and Hama to see its Norias, enormous water power wheels. 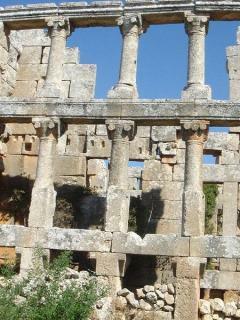 Apamée (Afamia) and the Noréas de Hama are on the tentative list of UNESCO World Heritage Sites. For anyone interested in World Heritage Sites, there are very few days that can rival this day trip from Aleppo (itself a World Heritage Site), but it may be a long time before it can be safely repeated. I visited Sergilla and othe villages in the reagon for 3 days from 18th till 21st August 2010. I was not aware of it's existance and I was surprised. The society, that built thiese villages roughly 1500 years back, were using skills long forgotten. Till date building fully made of rock exist. Sergilla is also an earthquake area, still many building are standing after such a long time. Maybe it was not the best time to travell, August is the hotest month and it was Ramadan aswell. Late fall or spring must be better. Damaged in War since WWII: Syrian Civil War "The ancient sites of northern Syria, comprising eight parks and a total of 40 villages, have suffered due to their close proximity to a key Turkish border crossing, used as the entry point for supplies.A number of Syrians who have been forced from their homes are also living in and among the ruins. Analysis of satellite images of the Jebel Barisha park show the creation of three compounds: two within the park boundaries and one just outside. They appear to have a military function,"
Kurdistan: Most are within the Afrin Canton, which "seems to have seen Kurdish settlement by at least the 18th century" (wiki) and is under Kurdish autonomous control since 2014. Not under control of the nominating state: Site nominated by Syria (2011), but the area currently is under control of the Syrian Democratic Forces (SDF). Extended from original TWHS: Originally only Qal' at Sem'an (Saint-Symeon).